You may have a scenario where you want to delete a credit card associated with your account. Maybe it's expired, maybe the number changed, etc. From the top Account Options navigation menu click Payment Methods. Once on the Payment Methods page simply hit the Delete Card option under the card you want to remove. In order to remove a card it must not be connected to any campaigns. 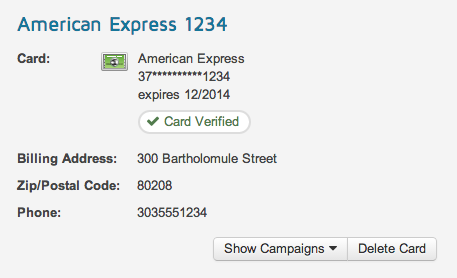 You can get to the campaigns a card is associated with by clicking Show Campaigns under the card, located on the Payment Methods page.